Opening a bar is a difficult task, but staying in business is even harder. That's why marketing is so crucial. So, let's talk bar promotion ideas. Not only do different bar marketing strategies help to attract new customers, they keep them coming back. Having great food and an awesome atmosphere is only the beginning for your bar or nightclub. To attract new customers and turn them into loyal fans of your bar, it’s important to keep them engaged. Bar sales shot up to $28.46 billion by the end of 2017, and smart bar promotions are an effective way to get a piece of that pie. Here are seven unique bar marketing ideas you can try, some with the help of your bar POS system, to get found by new customers and keep them coming back. Using online advertising to reach new potential customers can work very well...if done correctly. For example, if you offer online reservations, you can measure the dollar value of your advertising by attributing bookings to different ads you’re running. Social networking sites like Facebook and Twitter have advanced targeting capabilities that let you show ads to users within a a 1-50 mile radius of your location and at specific times of the day. Try advertising around lunchtime or dinnertime and see how this affects your bottom line, and which time of day has the greatest return on your advertising spend (ROAS). If you’re into radio advertising and have a nicely-sized advertising budget, you can try advertising on local radio stations or even targeting local users on music streaming apps like Pandora. People search online using generic terms like "bars in New York" or "places to get wings" more than they search for specific bar names, so having your menu online in a way Google and other search engines can index it properly can help you get discovered by more people online. Indexing refers to the process of search engines adding your pages into their search results. One of Google's major menu providers is SinglePlatform (as mentioned here). Trip Advisor, Facebook, and other websites that feature restaurants also use SinglePlatform for menu information, so it might be a good idea to sign up so that your menu can be indexed by these sources to become discoverable online. While Google may use SinglePlatform to source menu information, and other sources to determine locations on Google Maps, it likes to make primary use of it’s own internal data for mapping. Because of this, the best way to ensure you show up on Google Maps is to add your bar to Google My Business. Doing this also makes it easier for people to find your website, contact info, and hours on Google so that when they search for bars in the area, yours shows up as an option. In the location detail click the “Report a Problem” link. Choose “Other” on the Report a Problem screen. Add your business data via the various fields and submit. Another popular option comes with the rise of Google and Apple Maps alternative, Waze. Waze gives you the opportunity to pay for an ad placement on the app. While advertising used to reserved for national chains, they recently launched an SMB advertising program to reach a more localized audience. For just $2 a day, you can drive in store traffic with a pin on the map. If your guests are enjoying their time at your bar, they’re more likely to come back, leave reviews online, and recommend your bar to friends and family. A great way to entertain your guests (and encourage them to bring friends and family along) is to provide a selection of bar games and activities that appeal to your audience. Because of the social nature of games like pool and darts, customers will bring along larger groups of people instead of individual friends or family members, which leads to increased food and drink sales. Keeping customers occupied with these types of activities also makes them stay in your bar longer, which increases the average check size per customer. You can also make extra money by charging customers to use these amenities, but be careful about pricing being too high, as it may scare customers away and reduce loyalty. You could also offer weekly specials with your games, like Napper Tandy's in Walpole, MA. 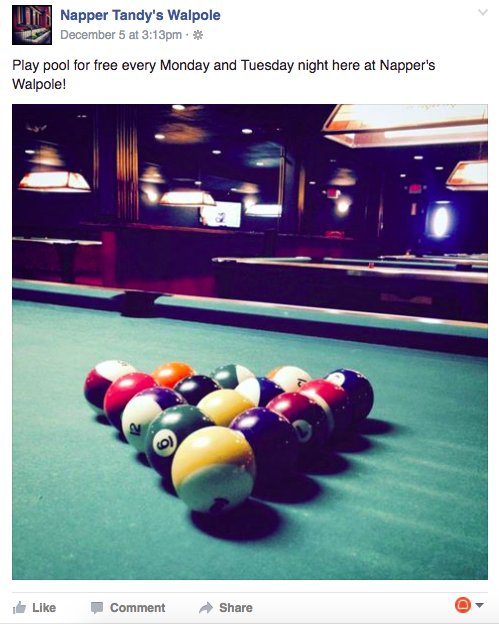 They offer free pool on Mondays and Tuesdays, which are otherwise relatively slow nights. Less traditional but increasingly popular comes the rise of trivia nights where teams gather to compete for the title of trivia champions. For example, a local Albany trivia host has seen a 257% growth in hosted nights a month – from seven nights to 25 in just a year and half. Live music is a great way to attract new customers, and hosting these events regularly can keep people coming back. Choosing local artists can bring in a loyal following, as these musicians are likely to have a passionate local fan base, many of whom see them every time they perform. You can easily find local artists by checking the event listings of smaller venues in your area, then reaching out to these artists on Facebook. Once you book an artist to perform in your bar, make sure you effectively promote the event. The biggest music fans are loyal to brands that support their scene; so treating local musicians well can result in a growth in customer loyalty for your bar. When hosting live music performances in your bar, make sure you get the appropriate music licenses from BMI, ASCAP, and SESAC. These organizations collect royalties from music users and redistribute them to the music copyright owners. Are there local businesses in your area to partner with for an evening? Pop-up events such as food nights, craft nights, and more help to drive more business to your restaurant by offering something slightly more outside of the box. For example, Cambridge, Massachusetts brewery Lamplighter hosts regular events with other Greater Boston businesses like Saus, an American-fare restaurant focused on condiments. Saus and Lamplighter bring together craft beer draughts and poutine, a crowd-pleasing combination that draws in crowds from around town. A bar blog is a great way to engage your most loyal customers online and drive awareness of your brand. It’s also a great way to build your email list - as is including your loyalty program as part of your payment process in the bar point of sale system. Stick to a regular posting schedule. Whether it’s daily, weekly, bi-weekly, or monthly, choose something you can realistically keep up with. Write about something that’s valuable to your customers. This can be recipes, fun drinking game ideas, or a topic that your customers value such as music or art. Choose something that your customers will want to share online with their friends. On your blog, include a call-to-action that drives customers to your bar. This can be a link to book a reservation, or a map showing your location. Having an awesome atmosphere and great food isn’t enough – you need to be able to effectively market your bar to attract and retain customers. Hopefully these bar marketing ideas gave you some new strategies to implement so you can reach the next level of success in your bar.